Hi friends! I hope you are doing well! We are doing pretty good. We are just trying to stay cool. It's gets HOT here and we have a black mini van and it's VERY hot in there. It's getting to the point where I only want to do errands in the morning and evening. Today, I am sharing another card I made for Gallery Idol. A while back, I made a set of cards using a panel I covered with washi tape then using both the die I cut out and the negative. It is one of my most popular posts on Pinterest. I decided to do a variation of that idea. I covered a panel of white card stock in washi tape. Then I die cut out the vases from Paper Smooches. I covered the washi panel in glassine to mute the colors a little. I offset the die cut vases on top of the glassine so it looks like a dark shadow but in actuality, you're seeing the black card base. Then I added a sentiment from Paper Smooches and some enamel dots from Doodlebug. 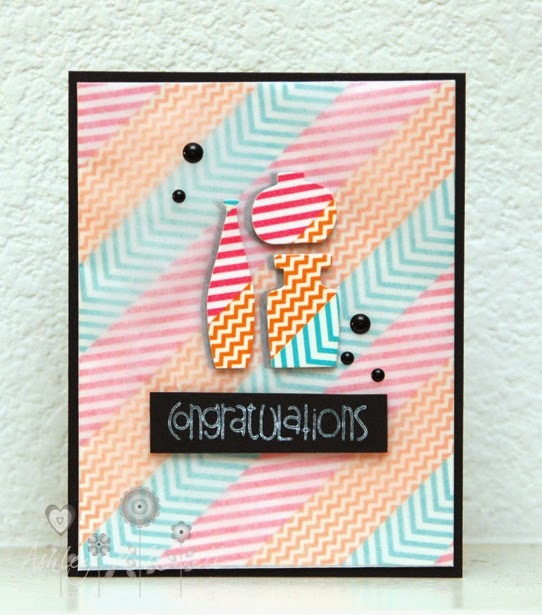 I'm also entering this in the Simon Says Stamp Die Crazy Challenge. This is amazing. The colors and patterns are fabulous. The black accents on this card are terrific. Thank you so much for joining us at the Simon Says Wednesday Challenge Blog. This is so cool!! I love the vellum over the Washi juxtaposed with the brightness of the die cut vases. So cool!! Love how you softened the back panel, great idea!